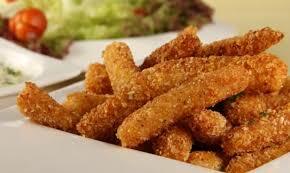 Palitos de Pescado - Fish Sticks - Tienditadepuertorico.com - Buy Puertorican Food Here!! the strips gently to "round" them. then in flour. Shake off any excess. Fry the strips in small batches until golden brown.